The retro dirty martini is reinterpreted as a dry vermouth and olive juice marinade for steak. 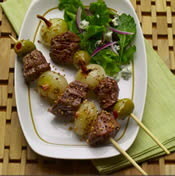 The steak kabobs include the typical martini garnishes of onions and olives. Makes 8 servings (2 kabobs and 1 cup salad each). 1. Heat large nonstick skillet on medium heat. Add mustard seed; cook and stir 1 minute or until fragrant. Immediately pour out of hot pan to avoid over-toasting. Coarsely crush seeds using a rolling pin or a mortar and pestle. Reserve 1 tablespoon for the Mustard Vinaigrette (recipe follows). 2. Mix remaining mustard seed, vermouth, oil, lemon juice, honey, olive juice, lemon peel, sea salt, garlic and pepper in large bowl until well blended. Reserve 1/4 cup of the marinade for brushing. Place remaining marinade in large resealable plastic bag or glass dish. Add steak; turn to coat well. Refrigerate 2 hours or longer for extra flavor. 3. Meanwhile, bring water to boil in small saucepan. Add onions; cook 5 minutes. Drain well. Cool onions slightly. Cut off top and bottom ends, then peel onions. Remove steak from marinade. Discard remaining marinade. Alternately thread steak, onions and olives onto 16 skewers. 4. Grill kabobs over medium heat 8 to 10 minutes or until steak is desired doneness, turning occasionally and brushing with reserved marinade. Serve kabobs with Mixed Greens with Mustard Vinaigrette. Mix 1/3 cup lemon juice, 1/4 cup olive oil, 2 tablespoons honey, reserved 1 tablespoon crushed toasted McCormick Gourmet Collection Yellow Mustard Seed, 1 teaspoon dry vermouth, 1/2 teaspoon McCormick Gourmet Collection Ground Mustard and 1/4 teaspoon McCormick Gourmet Collection Sicilian Sea Salt in medium bowl with wire whisk until well blended. Toss 8 cups mixed greens, 1 small red onion, thinly sliced, and 1/2 cup crumbled blue cheese in large bowl. Serve with vinaigrette.